This is another dish that I grew up eating in Bintulu, Sarawak. I remember having them in school canteens. 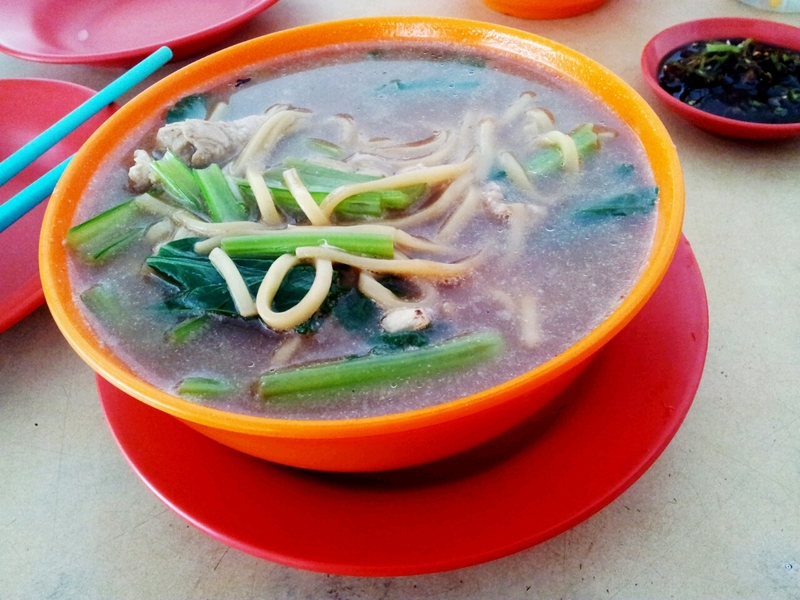 Now and then when I go back to Bintulu I’d order one… well, after I had my Kampua mee and Sarawak Laksa of course. I was in Bintulu for a few days back in March this year and we paid a visit to a restaurant/kopitiam that has been around for a long time and used to make good Chao Zhu Mian. Unfortunately, the standard has deteriorated. A rather ordinary bowl of Chao Zhu Mian, the broth was bland and I don’t even remember seeing any prawns in it. 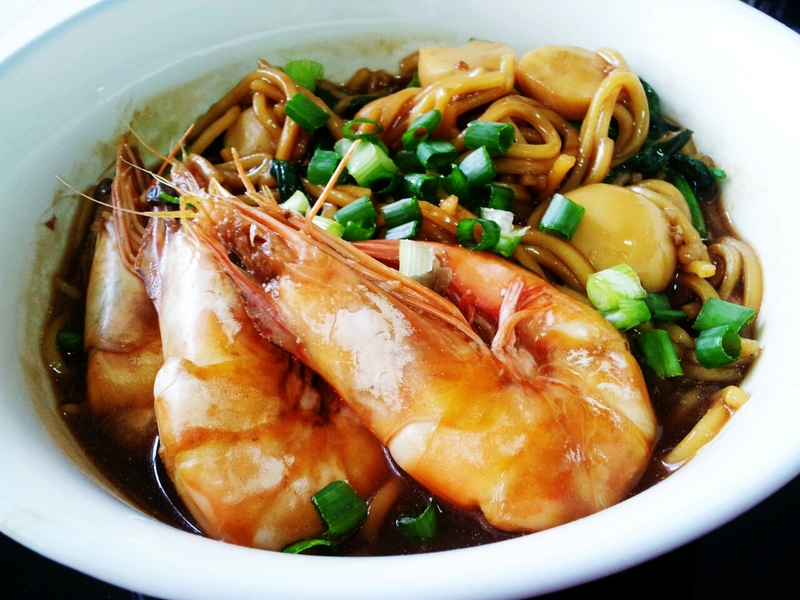 The best Chao Zhu Mian in Bintulu has to be the one upstairs of Pasar Utama (the wet market), their deluxe big prawn version is really quite divine. Though it doesn’t come cheap at over RM20 per bowl. A typical foochow dish, Chao Zhu Mian (炒煮面) means the noodles were stir-fried before braising in a dark soy sauce based broth. So the end product is more of a soup noodles dish. A bowl of Chao Zhu Mian should have thick fragrant soup (from the prawns, pork and wine) with plenty of wok hei from the frying process. The ingredients are very easy to find except for the Foochow red wine, but you can easily substitute it with Shao Xing wine. 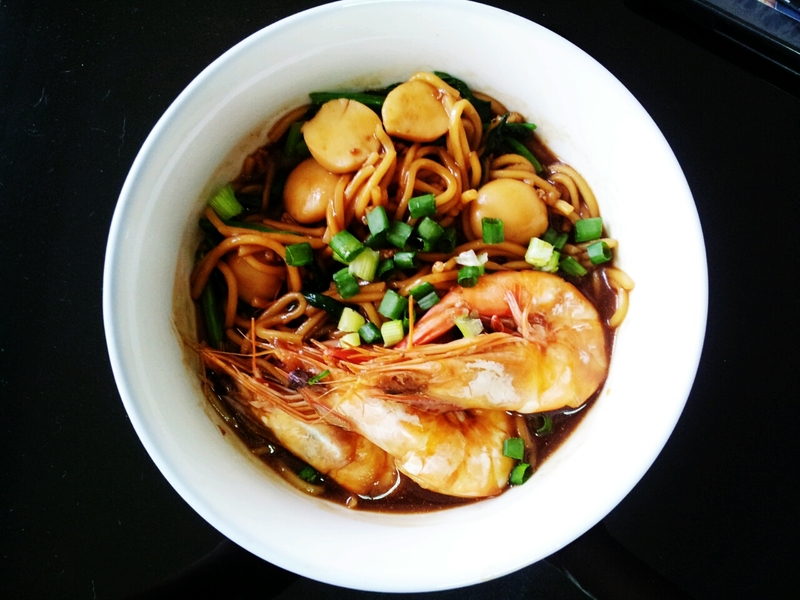 Deluxe Foochow Braised Fried Noodles (福州炒煮面), homemade version. Had a craving recently thanks to Rebecca who has just been in Sarawak, so off I went to work on the dish. There really isn’t much info online though so I’ve made this based on sensory memory. Wash the noodles thoroughly and set aside. Heat oil in pan/wok over highest heat. Add garlic, follow by pork, prawns and fish balls. Give it a quick stir before adding in the noodles. Add wine, light and dark soy sauce followed by choy sum. Working quickly to combine everything. Then add enough water (for one serving, for example: around 150ml) to cook for 3-4 minutes. Careful not to overcook or the noodles will turn soggy. Mix cornstarch with a bit of water and add to the mixture. Once the broth has thickened up sufficiently, it’s time to turn off the heat and add a final touch of wine. Garnish with spring onion and serve. All done under 10 minutes! It’s important to leave the prawn heads on for the broth to get more of the flavour. If you hate peeling prawns (I usually do, but did this for nicer presentation), another option is to throw the heads and shells in the broth and pick them out before serving. Such an easy dish to put together, and doesn’t not require much of your time. It’s almost like instant noodles but so much better for you. By the way, you could also add black vinegar for a Hokkien version of this dish. Submitted this recipe to Recipe Box #8 by Bizzy Bakes. I usually prefer choy sum but I do use bok choy a lot too. Love these greens! Ahhhaa…I think I had this when I visited Sibu. Hmmmm…not that tough to make it at home. Shall give it a try. Yeah in fact most people in Sibu/Bintulu also make this at home. 🙂 It’s easy enough and you can add anything you like too! Nice finding these post. I love noodle soup. I’ll do this at home. Please post more noodle recipe. Been to Malaysia and Singapore before and I love the food except that Malay food are so hot! Huuuugh! Actually not all Malaysian food is hot. Probably only half of them are. Glad you like this recipe and thanks for dropping by and leaving a comment! Yes! I can never say no to noodles. There’s a really nice version from another shop but I don’t have a picture of it. They use really really huge prawns, almost like a small lobster! I love going back home and eating the dishes you grew up eating – there;s nothing like it! This looks so homely indeed! would love to have this!! i must bookmark this so that i can make this dish when the sarawak food event comes along next month. Are you aware of the malaysian food fest? you can chk it out in my blog. I think you should be able to do this one! Set two sheets of mat and the other layer of fabric. The only downside is the time you need to wait for the kit to reach in thhe mail. The total amount of plastic products also is rising.